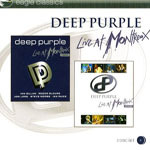 Share the post "Album review: DEEP PURPLE – Live At Montreux 1996 and 2006"
This packaging of three Deep Purple Montreux appearances is part of a new mid-price series ‘Eagle Classics’. And it’s a great way to catch up on favourite bands, especially if you didn’t shell out earlier for the individual releases. Purple’s first featured Montreux gig in 1996 sees the band in fine form, with Jon Lord behind the keyboards and with two tracks from then current album ‘Purpendicular’ (‘Ted the Mechanic’, ‘Hey Cisco’). It was, though, the 25th anniversary of ‘Fireball’ so it is fitting that the band start with the title track and also include ‘No One Came’. Whilst some will argue the merits of guitarist Steve Morse (who joined in 1994) versus his predecessor Ritchie Blackmore there can be no doubt that Morse re-energised Purple during this period even if he lacks Blackmore’s sense of danger and off-the-wall-ness. There’s some great interplay – for example between Lord and Morse on ‘Black Night’ – whilst Morse’s take on “that riff” is positively pneumatic. Two tracks ‘Sometimes I Feel Like Screaming’ (from ‘Purpendicular’) and ‘Fools’ (from ‘Fireball’) are featured from the 2000 festival. This album was originally released in 2006 as a separate CD and DVD (the latter has bonus material). Fast forward six years and the band are back, this time with Don Airey (who joined in 2002) and the first official live release from the Mk VIII line-up. Avid Purple watchers will know that this album was released earlier this year with a DVD which includes bonus tracks and band interviews. In truth, it’s the one to pick up (effectively superceding the original separate CD and DVD issue in 2007). The band feature three tracks from then current album ‘Rapture Of the Deep’ (including an incredible ‘Wrong Man’) along with a spirited ‘Strange Kind Of Woman’ and ‘Space Truckin’ which remain in the setlist today. Thankfully there is little duplication between these shows, only ‘Pictures From Home’, ‘When A Blind Man Cries’ and of course ‘Smoke On The Water’ which holds much greater poignancy when played in this environment. The 2006 version of the classic song has a deceptive jazzy intro before Morse gets down to business. For those just getting up to speed, and maybe inspired by the band’s recent UK tour, this reasonably-priced 2-CD set fills in a few gaps whilst confirming the band’s prowess during a 10-year period even though studio albums have been thin on the ground more recently. This entry was posted in ALBUM REVIEWS, ALBUM REVIEWS (Mobile), All Posts, Reissues and tagged 1996, 2006, album, concert, Deep Purple, Don Airey, Eagle Classics, Ian Gillan, Ian Paice, Jon Lord, Live At Montreux, review, rock, Roger Glover, Steve Morse. Bookmark the permalink.